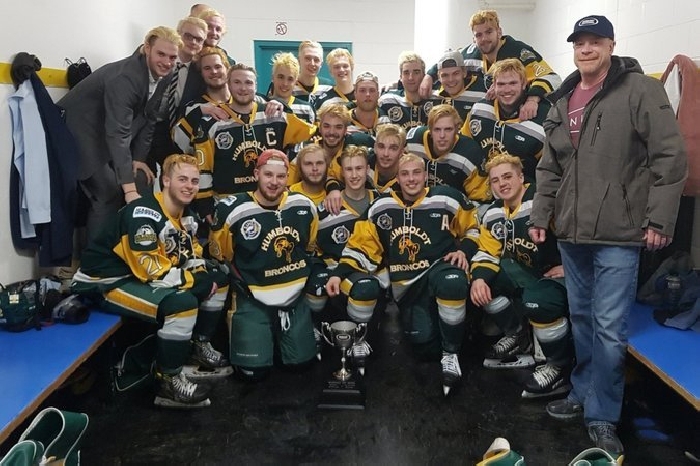 People flooded the sports and social complex in the Humboldt on Saturday, seeking solace after learning the devastating news that much of the roster of its beloved junior hockey team had been killed, and many others wounded, in a terrible highway crash the day before. Fifteen people died when a bus carrying the team, the Humboldt Broncos, to a Saskatchewan Junior Hockey League playoff game collided with a tractor-trailer late Friday afternoon. The other 14 people aboard were injured. The team’s head coach, Darcy Haugan, was among the dead. The team has a storied history, having twice won national championships, and, as a community-owned squad, it holds a central place in this town of about 4,800 people. “The arena is really the focal point of the community,” former Mayor Malcolm Eaton said. To say hockey is a big part of this farming town’s life would be an understatement. The main road through Humboldt is named Glenn Hall Drive, after its hometown hero who went on to the N.H.L., winning two Stanley Cups as a goalie for the Detroit Red Wings and Chicago Black Hawks. The Humboldt arena has a capacity of 1,854 — a seat for every 2.5 residents of Humboldt. During playoff games, like the two held against the Nipawin Hawks this past week, the arena is so full of spectators, it is standing room only, Eaton said. But on Saturday, people came to the sports complex for a far different reason: to meet with crisis counselors, commiserate and get updates on their players. All of the wounded were transferred from three local community hospitals to Saskatoon to be treated, officials said. The driver of the tractor-trailer did not sustain injuries in the crash, the police said. R. J. Patter, the father of player Derek Patter, tweeted a photo of his son and teammates Nick Shumlanski and Grayson Cameron who were injured in the accident. Prime Minister Justin Trudeau said in a Twitter post that the loss seemed unimaginable. “My heart goes out to everyone affected by this terrible tragedy,” he said. Mr. Trudeau called the town’s mayor and the team’s president to offer condolences. Only four of the team’s 24 players are from Humboldt. The rest moved there from towns across Saskatchewan and neighboring provinces. Ages 16 to 21, the players are billeted in local homes, and the deaths feel particularly personal. The players had been mainstays at community fund-raisers, hospitals and senior ctiizen homes. During a big snowstorm this past winter, they all went out to shovel people’s driveways, Eaton said. “They become part of the family,” said Eaton, who took many into his own home over 10 years, growing so close he’s been invited to weddings. An outpouring of grief and support emerged. Hotels offered family members of the victims free accommodation. A Go Fund Me webpage for the team, raised more than 1 million dollars in less than 20 hours. As the news spread, other sports teams — professional and amateur — began sending their condolences publicly. Across the country in Toronto, the mayor announced the city’s sign was glowing green and yellow — the official colors of the Humboldt Broncos — in support.